A simple, inexpensive spray method that deposits a graphene film can heal manufacturing defects and produce a high quality graphene layer on a range of substrates, report researchers at the University of Illinois at Chicago and Korea University — an alternative to the chemical vapor deposition process developed by MIT and the University of Michigan for creating large sheets of graphene, recently reported by KurzweilAI. 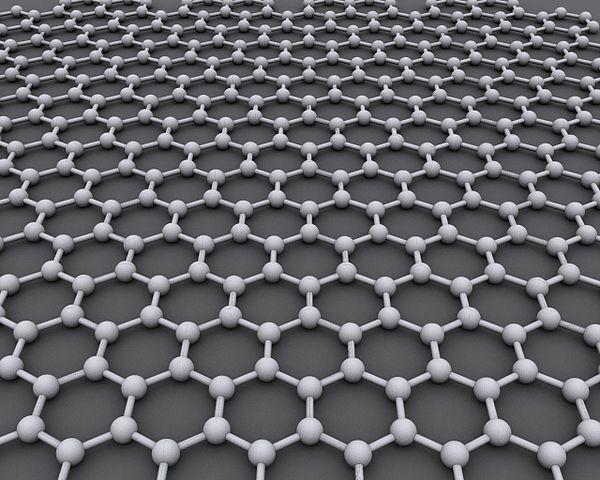 Graphene, a two-dimensional wonder-material composed of a single layer of carbon atoms, is strong, transparent, and an excellent conductor of electricity. It has potential in a wide range of applications, such as reinforcing and lending electrical properties to plastics; creating denser and faster integrated circuits; and building better touch screens. However, there has been no easy way to scale up from microscopic to large-scale applications without introducing defects, says Alexander Yarin, UIC professor of mechanical and industrial engineering and co-principal investigator on the study. “Yarin first turned to solving how to deposit graphene flakes to form a consistent layer without any clumps or spaces. He went to Sam S. Yoon, professor of mechanical engineering at Korea University and co-principal investigator on the study. “Imagine something like Silly Putty hitting a wall — it stretches out and spreads smoothly,” said Yarin. “That’s what we believe happens with these graphene flakes. They hit with enormous kinetic energy, and stretch in all directions. Other attempts to produce graphene without defects or to remove flaws after manufacture have proved difficult and prohibitively expensive, Yarin said. The new method of deposition, which allows graphene to “heal” its defects during application, is simple, inexpensive, and can be performed on any substrate with no need for post-treatment, he said. Yarin and his Korean colleagues hope to continue their successful collaboration and foster the development of industrial-scale applications of graphene. Researchers at Yonsei University and the Korea Institute of Science and Technology are co-authors on the paper, which is available online in the journal Advanced Functional Materials. Initial support for the collaboration between Yarin’s group at UIC and Yoon’s group at Korean University was provided by the Office of International Affairs Nuveen International Development Fund at UIC and by Korea University. The industrial scale application of graphene and other functional materials in the field of electronics has been limited by inherent defects, and the lack of simple deposition methods. A simple spray deposition method is developed that uses a supersonic air jet for a commercially available reduced graphene oxide (r-GO) suspension. The r-GO flakes are used as received, which are pre-annealed and pre-hydrazine-treated, and do not undergo any post-treatment. A part of the considerable kinetic energy of the r-GO flakes entrained by the supersonic jet is used in stretching the flakes upon impact with the substrate. The resulting “frozen elastic strains” heal the defects (topological defects, namely Stone-Wales defect and C2 vacancies) in the r-GO flakes, which is reflected in the reduced ratio of the intensities of the D and G bands in the deposited film. The defects can also be regenerated by annealing.